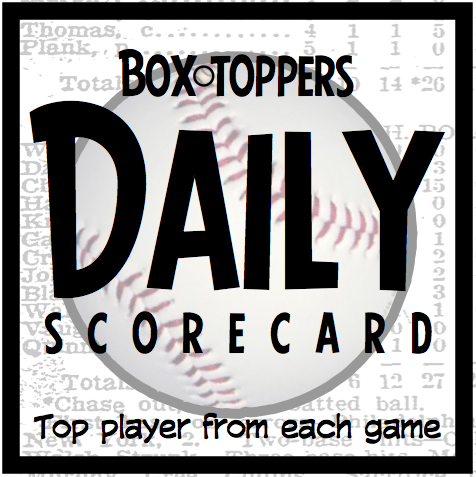 Cardinals pitcher Adam Wainwright is Saturday's Player of the Day and rises to ninth place among players in Box-Toppers points for the 2013 season (see updated top 10 list on the home page). Wainwright pitched a complete game, struck out eight and gave up only one run in the 7-1 win over the Athletics. Wainwright earns 2.0 Box-Toppers points for being Player of the Day, giving him 10.7 for the season. He is the 10th player to reach 10.0 or more Box-Topers points this season. Chris Davis of the Orioles is American League Player of the Day. Davis homered twice and drove in five runs in the 11-3 win over the Yankees. Hanley Ramirez of the Dodgers is National League Batter of the Day. Ramirez homered, drove in three runs and went 3-for-4 in the 4-3 win over the Phillies. Wainwright receives 2.0 Box-Toppers points for being Player of the Day. Davis receives 1.7 for AL Player of the Day. Ramirez receives 1.5 for being NL Batter of the Day.